The DP26 series are discontinued. Please contact our Sales Engineering department for replacement details. 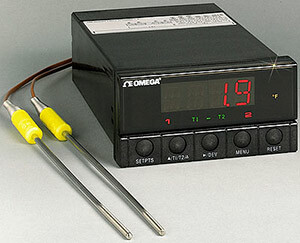 The DP26 differential temperature meter is a versatile dual input indicator/controller. The touch of a button toggles the display between T1, T2 and T1-T2. Analog output is optional, using any of the three values available. The optional control relays for alarms or on-off control can be tied to T1, T2 or T1-T2. The user selects J, K, T or J DIN thermocouple input from the front panel. The units of measure can be switched between °F and °C with the front panel pushbuttons. The optional analog output can function as retransmission of temperature (assignable to T1, T2, or T1-T2) or be assigned to Setpoint #1 and used as a proportional control output. Setpoint #1 will still continue to operate as a setpoint, while the analog output of either 4-20 mA or 0-10 V can be used to proportionally control an external process. 참고: Display and Output Options are not Field Installable.